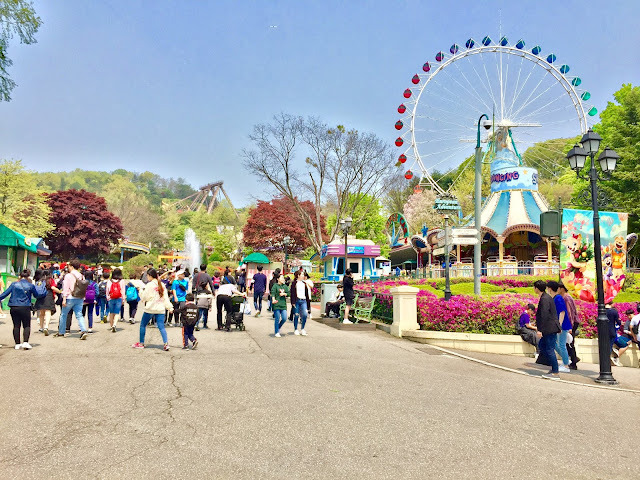 As the largest theme park in South Korea, Everland is the centrepiece of the C&T Corporation subsidiary of the nation's electronic giant, Samsung (Samseong or 삼성 in Korean). 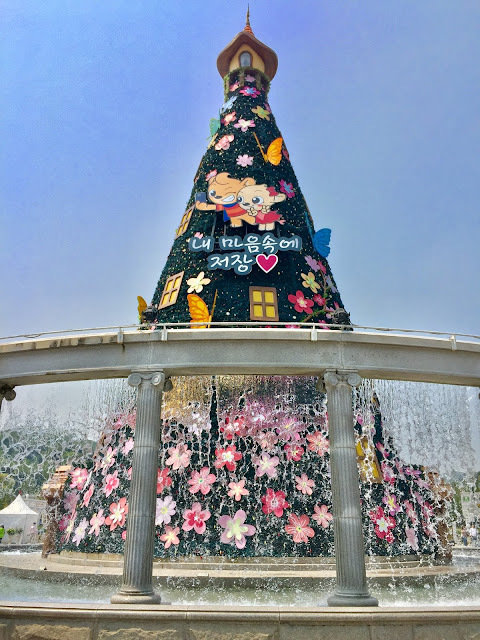 Located in Yongin - approx. 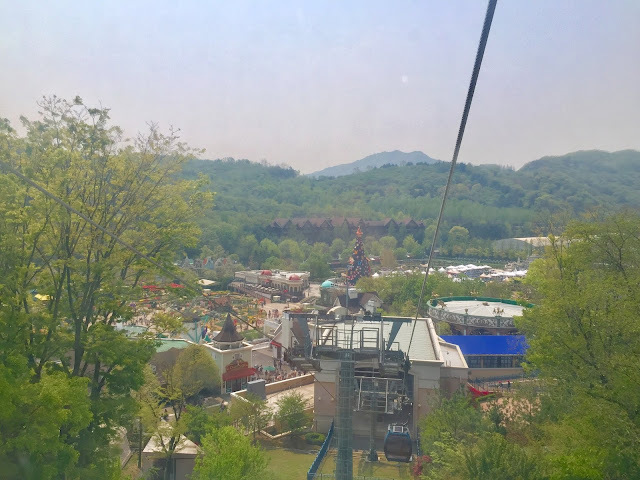 an hour Southeast of Seoul - the theme park stands on a natural valley surrounded by the beautiful and lush landscape of the mountains around. In 2017, the theme park is notable for receiving 6.31 million guests, making it the 17th most visited theme park worldwide (2nd in South Korea after Lotte World). 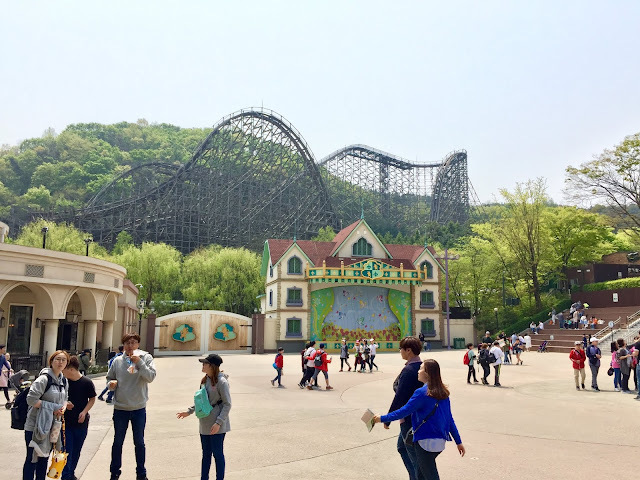 Among the coaster enthusiasts and communities, Everland is renowned for being the home of the youngest and arguably biggest Intamin prefabricated wooden coaster, T Express, which I reviewed a couple of weeks ago (if you haven't read it, check it out here). The roller coaster catapulted the park to international popularity not only because T Express is a really good (damn good!) 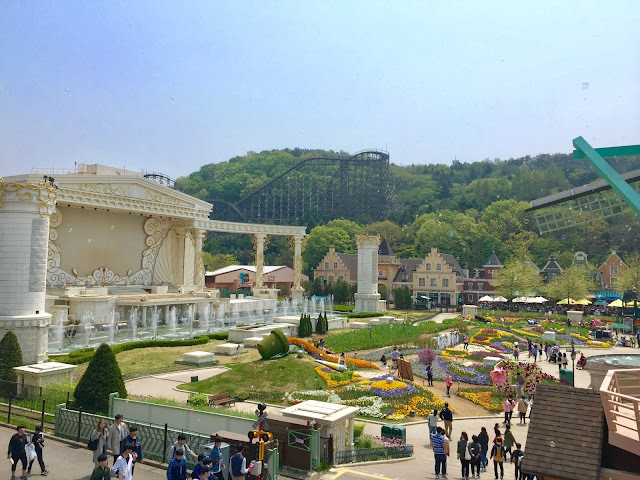 roller coaster, but also because it's 1 of the 4 great Intamin prefabricated wooden coasters in the world, the other 3 being Colossos at Heide Park, Balder at Liseberg, and El Toro at Six Flags Great Adventure. 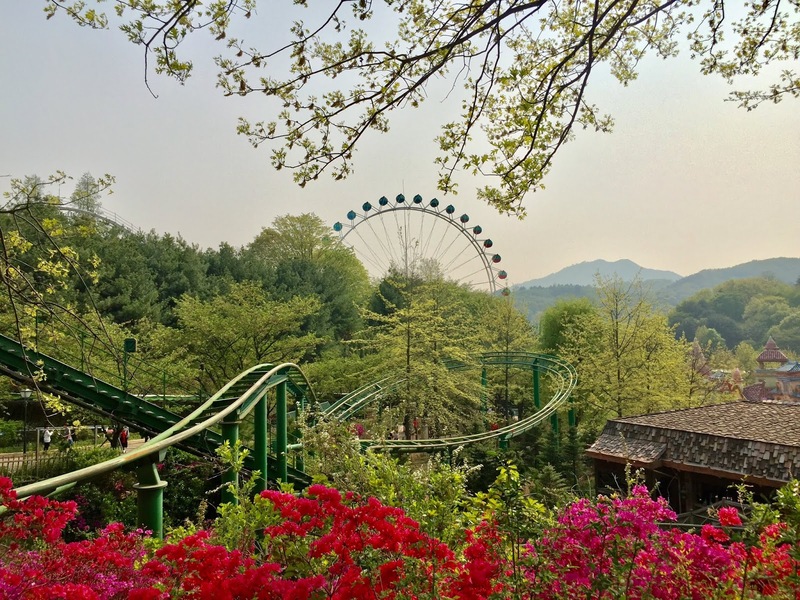 Spring at Everland is made more beautiful by its magnificent natural surrounding and setting. 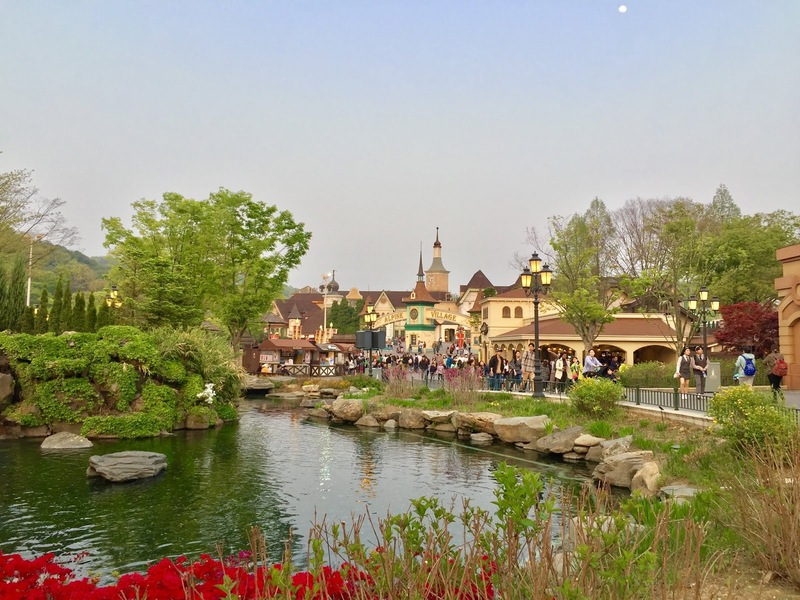 While much of the attention has been on T Express alone, I personally think that Everland deserves more attention for the theme park itself. 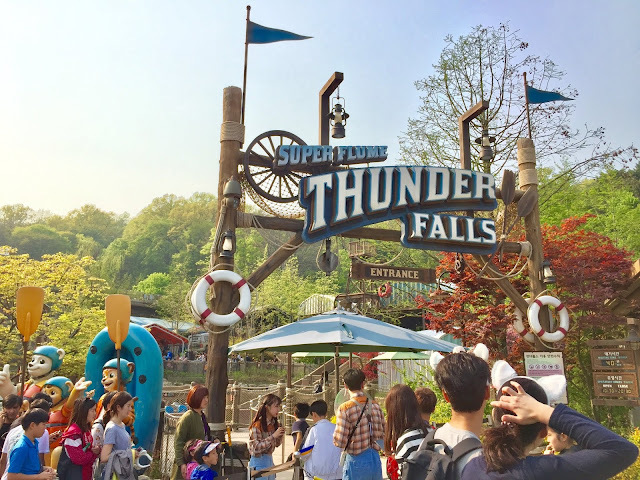 The beautiful landscape, diverse line up of attractions, and smart use of express pass system make Everland a standout amongst the increasingly competitive theme park industry in the APAC region. So, what does Everland have to offer other than the world-famous, chart-topping T Express? WEAR COMFORTABLE SHOES. This park gives you serious hills. The walk down is equally unforgiving as the climb up when you're exiting the park. Those flip-flops and heels won't do you good when you're sprinting to be the first in line for T Express. DOWNLOAD THE APP AND USE IT AT THE PARK. 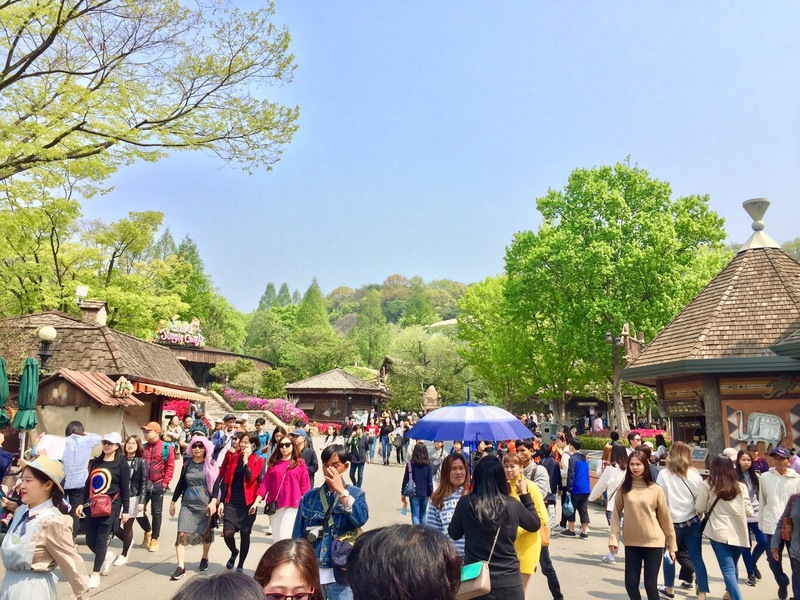 Everland has express pass system that allows you to skip the queue. 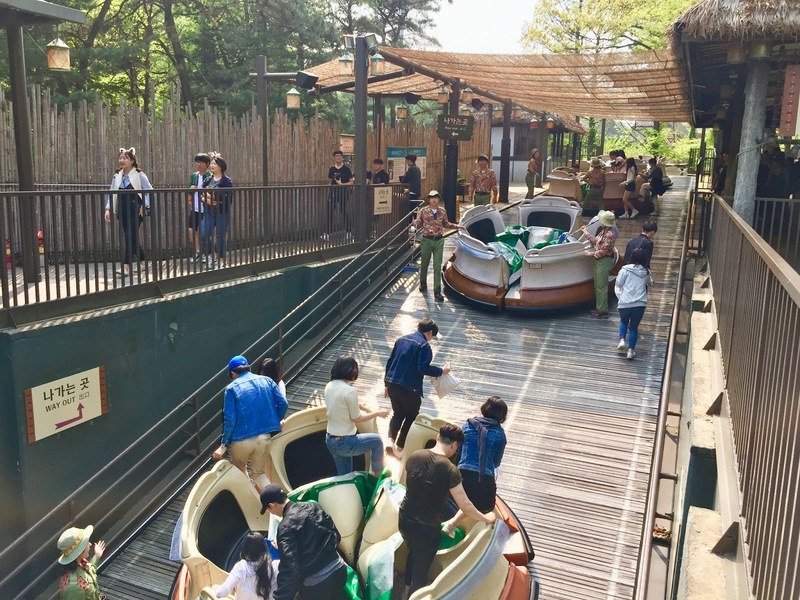 But it's important to note that, unless you decide to buy in advance along with your admission ticket, the express pass system at Everland uses exclusively electronic means. You reserve your ride times using the official app. Note that there is no Wi-Fi within the park vicinity. Click the following to download for your iOS devices or Android devices. 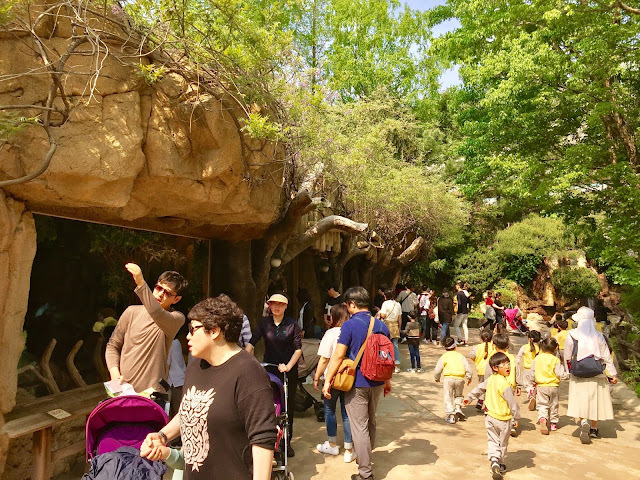 Massive crowd on the day of my visit prompted the park to open the gate 20 minutes early to prevent overcrowding. PLAN ACCORDINGLY. Similar to Japanese crowd, Korean crowd arrives promptly and early before the park opens. In fact, on the day of my visit, Everland was so packed that they had to open the gate 20 minutes early so that the entrance plaza did not become overcrowded. ARRIVE EARLY. Unlike Disney's express pass system - where you can reserve your ride time only after certain time - Everland's fully mobile system allows you to do so based on the experience points (called XP) you obtain. You'll require different number of XPs to reserve ride time on different attractions, e.g. T Express requires 5 XPs while the Rolling X-Train only requires 4 XPs. You gain 1 XP for each 30 minute since your ticket is scanned through the entrance turnstiles. The earlier you arrive, the faster you accumulate more XPs, the better your chance to reserve that much-coveted ride time on T Express and other high-demand attractions. 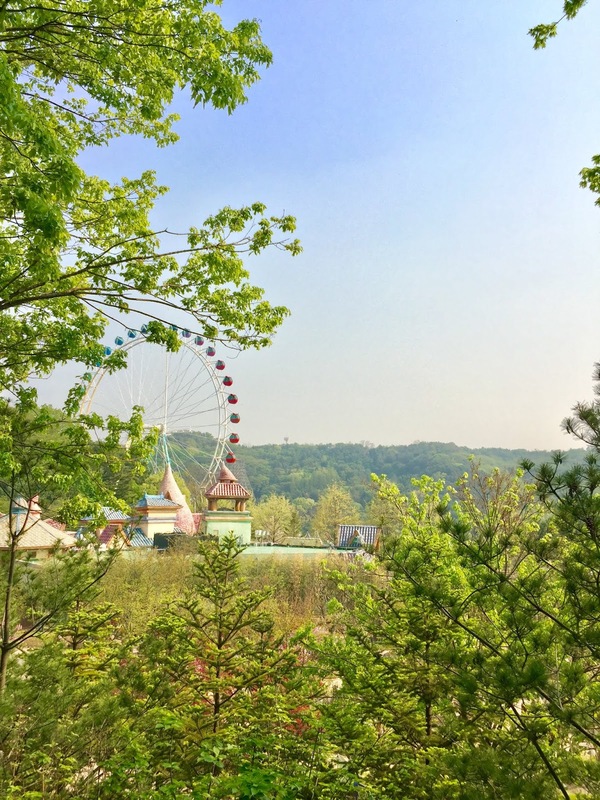 Everland's terrain makes it a challenging park to navigate. Use the travelator if needed. As the largest theme park in South Korea, it's as such expected to have massive crowd thronging to the park on public holidays and weekends. On the day of my visit, that was no exception: the Friday of a long weekend - combined with perfectly sunny weather and pleasant temperature - makes the crowd get out of the city to enjoy the beauty and thrill of Everland. As I arrived at 9:00am - supposedly an entire hour before the park opening time - I was met with a massive crowd already lining up in front of the entrance plaza. The information board above the turnstiles suggested that due to the crowd, the park will be opening its gate to the public 20 minutes earlier than expected. Wow, talk about first impression. I had mixed feeling about this: I went on a bad day. Uh-oh: the park already bustling with crowd an hour before the park's opening. In general, the park is very nicely themed. For the sake of comparison, I'd say it's fair to think this is a park that is a notch up above Busch Gardens Williamsburg, which in my opinion is already a beautifully landscaped and themed theme park in Williamsburg, VA. Not that the theming is on par with what Disney and Universal have done in their parks, but I can say that Everland is doing a really good job in making theming that is pleasing to the eyes and other senses. 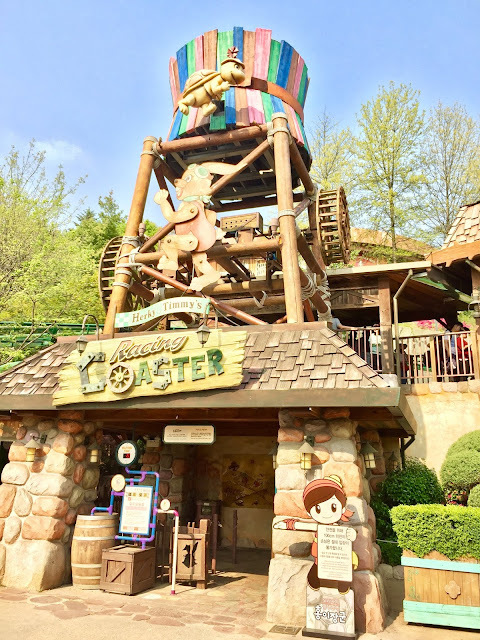 Even things that are often seen as 'standard' in other parks, like carnival rides, are nicely themed at Everland, which I appreciate a lot. The first plaza following the park entrance was nicely decorated with Spring materials to welcome the season. Even a simple carnival ride like Twister is nicely themed at this park! Now let's talk about that terrain... Everland poses serious terrain changes throughout the park. So if you're an individual who normally requires assistance with devices such as sit-down scooter or electric wheelchairs in a theme park, Everland might give you serious challenges for yourselves to navigate your day out. Some inclines are seriously steep that I think it might be too much for your assistance devices. While it doesn't look like it, this pathway poses serious incline to the guests. 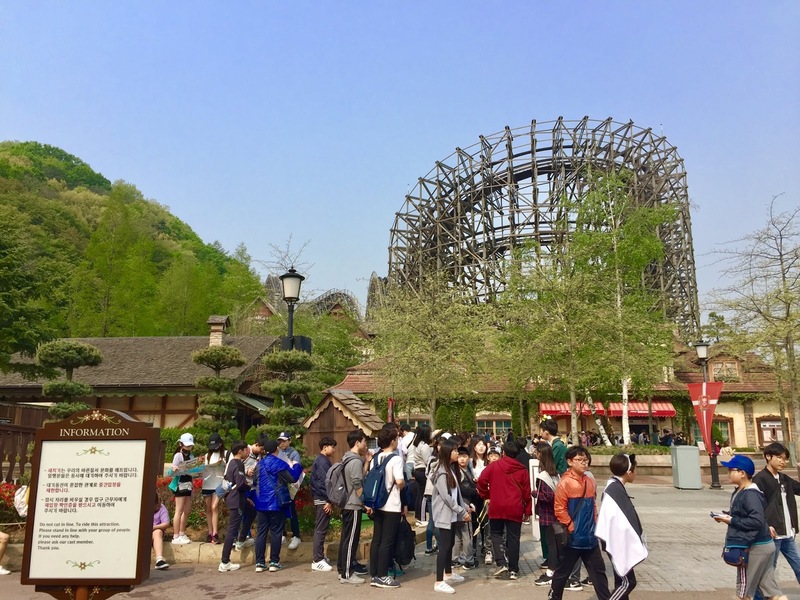 T-Express, the park's star attraction, is located in the valley section of the park, far below the terrain level that the entrance plaza is located at. 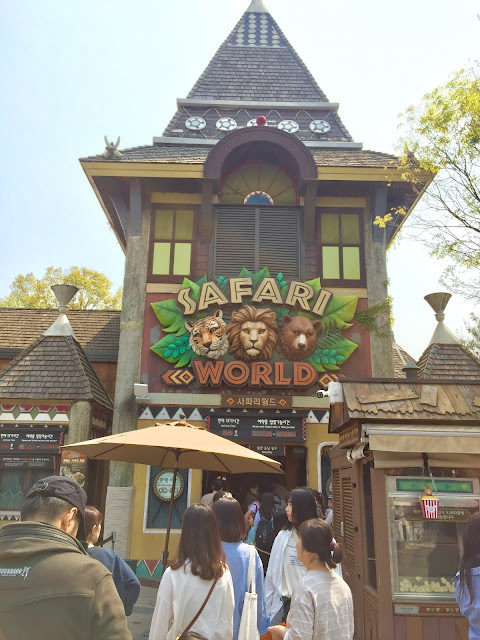 What I didn't know about Everland is that apparently it's a mix // hybrid of theme park and zoo. While the zoo section is not massive and full-fledged like legit zoo, Everland still does a great job in creating enclosures that are enjoyable, family-friendly, and educational. 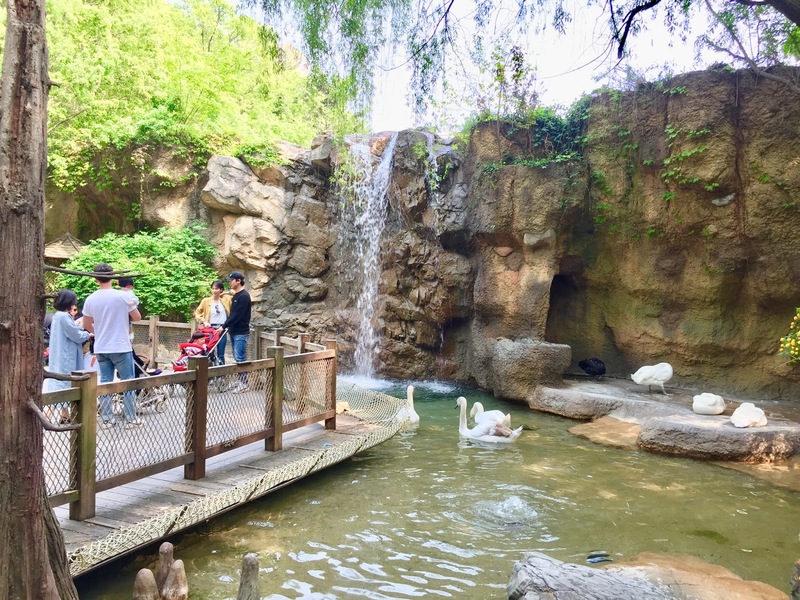 The swan enclosure allows guests to get intimate with the animals. 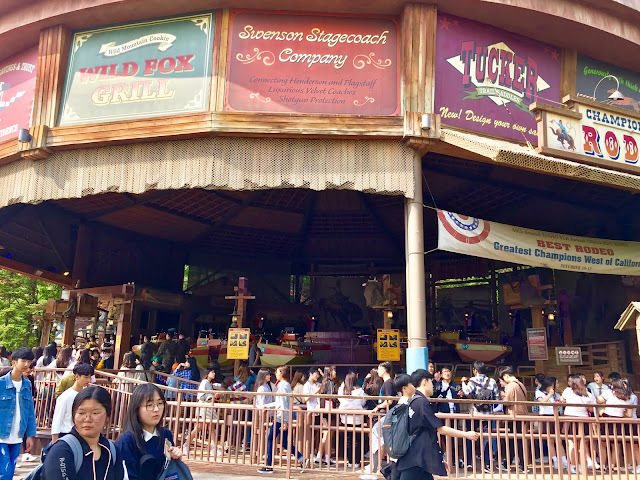 If there's one thing that I should be aware of about this park, I had always heard about how bland and disgusting the park meal is, particularly the Western options. Fortunately, this wasn't the case with - at least - the Asian options. I chose the Japanese option at Magic Time Restaurant and it was actually very nice and decently priced. 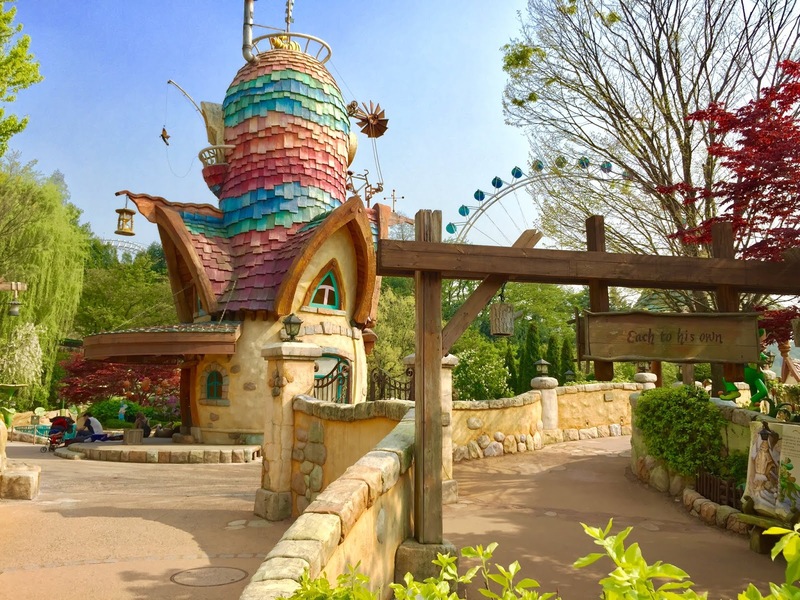 Magic Time Restaurant is the most popular restaurant in the park for its wide variety. 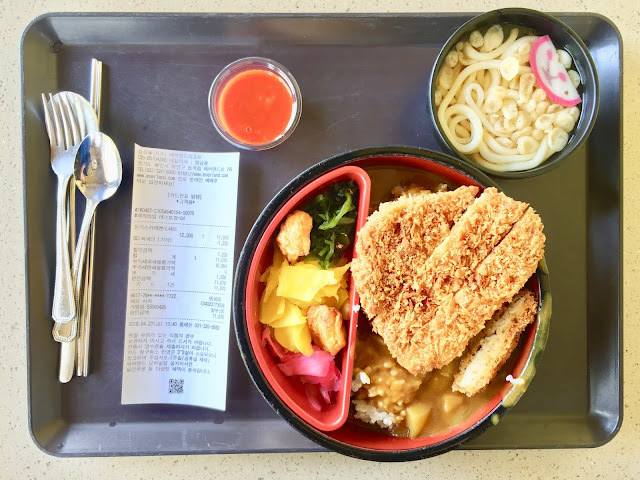 This massive katsu curry set meal was actually really good and decently priced (KRW11,875 ~ USD11). Both hot and cold water are available for free in the restaurant through the dispensers. One more thing to note is the opening hours of the attractions. While the park opens at 10:00am - in my case 9:40am - plenty of attractions do not open until later time. On the day of my visit, T Express did not open until 10:30am. Given that was the main reason of my visit to Everland, I sprinted right away. As expected, majority of early-comers ran directly to T Express as well. I was worried about massive bottleneck problem. 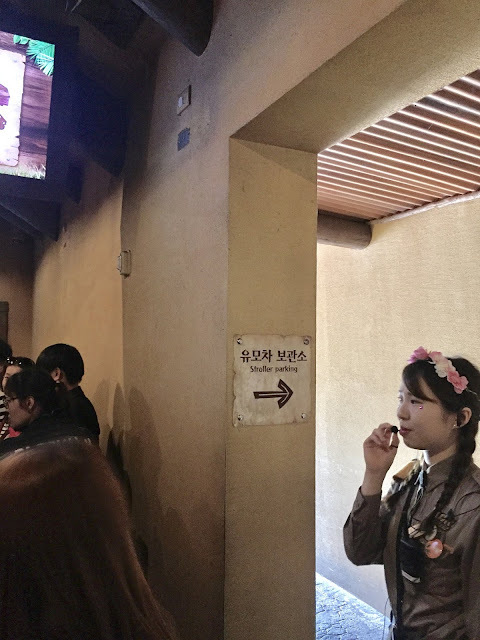 To my surprise, the staffs managed the crowd extremely well - perhaps even better than Disney standard - allowing an orderly line of two-by-two to form by itself. 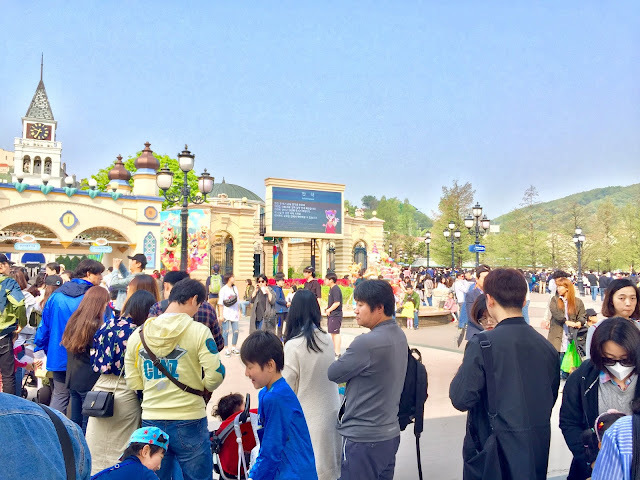 Massive crowd waiting for Everland's star attraction, T Express, to open. It's pretty obvious that when it comes to attraction highlights, T Express would simply top the list. Because I have posted a review of it, I wouldn't say much about it. But let's just say it's a great coaster. It's so good that it knocks El Toro down one spot; became my favourite roller coaster I've ever been on. Check out my review here! 10/10. T-Express is my favourite roller coaster of all time. 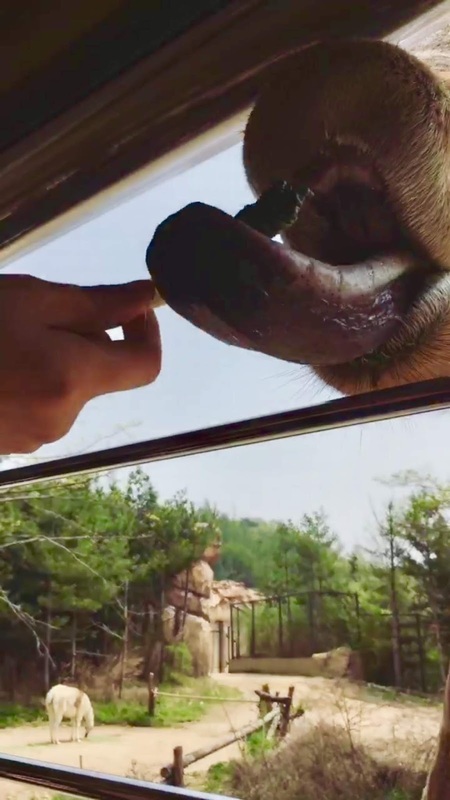 Another attraction that is very popular amongst guests is the Lost Valley attraction, which is a safari ride throughout mostly herbivores and gentle omnivores. While it's not massive as, say, Kilimanjaro Safaris at Disney's Animal Kingdom, it's still a very nice safari ride. 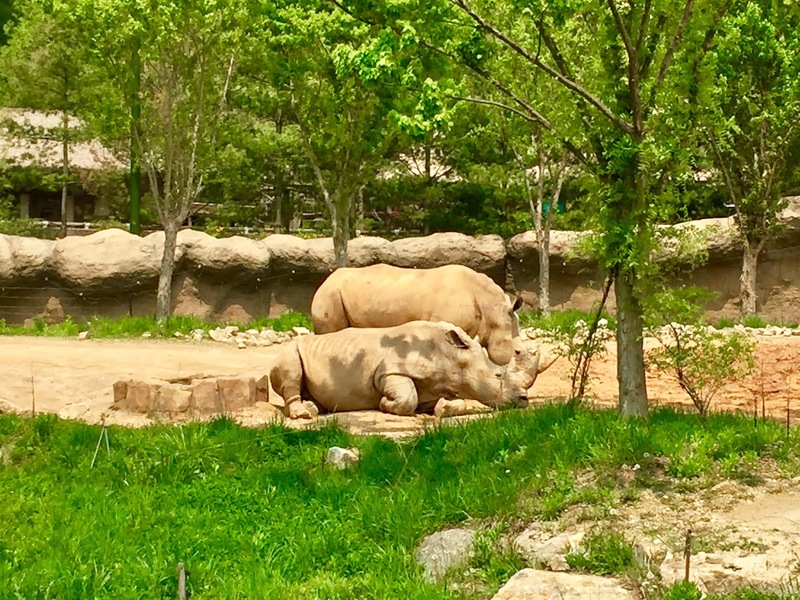 The enclosures are small, but the animals seem to be very well-cared of. As a token of surprise, there was even a feeding session on my tour. That would definitely not happen at Disney! For a gentle safari ride that is enjoyable for everyone, I'd say that this is a must-ride. 9/10. 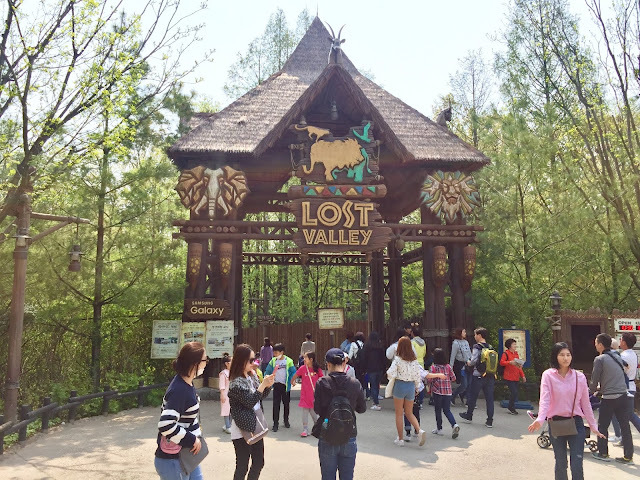 The entrance to the Lost Valley safari ride. 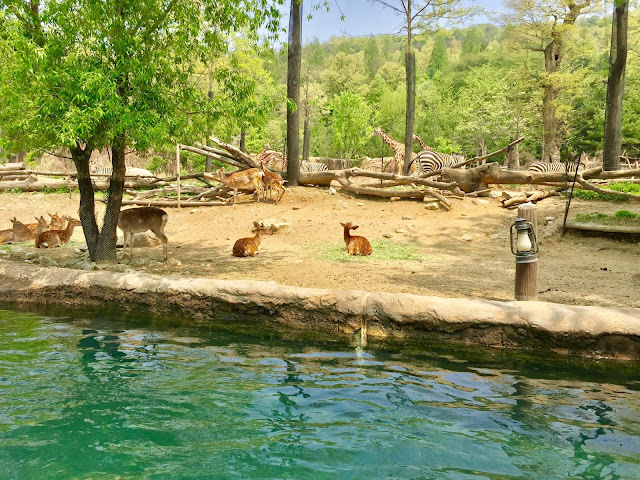 The enclosures are pretty well set, clean, and the animals seem to be happy to be there. Oh, and I also love the fact that this ride has dedicated stroller parking within the attraction itself, not outside. 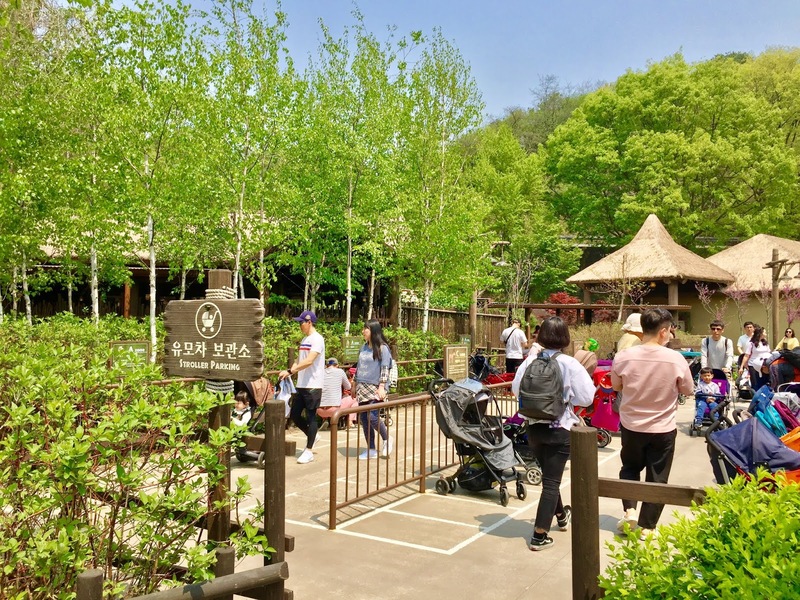 Kudos to Everland for making this attraction truly family-friendly. Bringing babies on-board? Not too worry. Lost Valley has a dedicated stroller parking inside the line, so you don't have to worry about parking your strollers outside the attraction. Next door, there's another safari ride called Safari World that takes guests to enclosures holding more dangerous animals (carnivores). 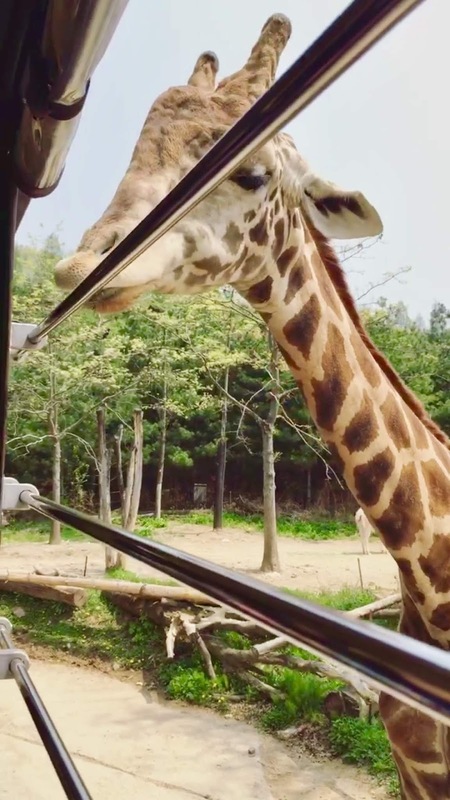 For this safari ride, the vehicle used is fully enclosed with glasses and metals. Unfortunately, the queue time for the ride was well above 60 minutes, so I decided to sit this one out. I decided to sit Safari World out since the line was above 60 minutes throughout the day. Next, we have Amazon Express, a rapids ride that resembles similarity to River Quest at Phantasialand. Compared to other rapids rides out there, this is a surprisingly tame one, despite the massive rapids that are encountered throughout the course. It doesn't help that actually this attraction won't get you that wet as - you guessed it - you're required to wear protective plastic cover over yourself. Amazon Express seems to be one of guests' favourites. Riders about to go on a journey... with their protective shields. No seriously... look at this. It's understandable that in general, Asians don't like to get wet when they spend an entire day out there. But the main attraction of water rides is the water itself: the anticipation of getting wet and/or WHO is getting wet. By adding this protective shield, I feel that Amazon Express immediately loses its excitement value. The point of water ride is no longer there. So what is this then? A boat ride? No, it's supposed to be a rapids ride, and a rapids ride should give you that anticipation. Amazon Express' loading/unloading dock actually allows guests to get out while the boats are still climbing up. Another thing that I found puzzling was the operational aspect. The unloading section of the station is pretty much a rather steep climb up back to the station. Yet staffs actually encourage guests to get out of the boat as soon as the boats are fully on the lift. I think this wouldn't have happened in the U.S., where slight mishaps on the guests would probably result in lawsuits, which have always been welcomed with wide arms throughout the nation. Amazon Express just doesn't do it to me. It's fun... if the protective shield is removed. For this, I'll give this ride a 5/10. I seriously have no idea what's the point of that. The Thunder Falls attraction is far superior to Amazon Express. On the opposite end of the park, though, there's a super flume ride that I'd say is far superior to Amazon Express. It's called Thunder Falls and it's super duper awesome. Unlike your typical flume ride, Thunder Falls actually goes both forwards and backwards. The attraction smartly hides the backwards portion of the ride - which includes a drop and a small bump - so that part usually catches riders by surprise. In addition, Thunder Falls also has lengthy rapids section, which I found weird since it's a flume ride. The grand finale is a 65-feet drop down into three pairs of water jets, which are guaranteed to make you wet. Thunder Falls is guaranteed to get you wet. Notice how all of the riders on the boat ducked their heads down. 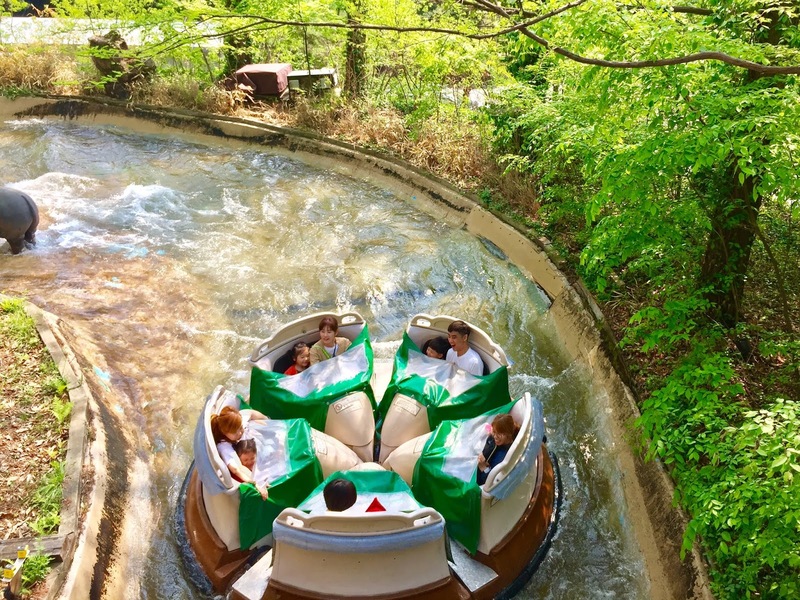 Thunder Falls is an intense flume ride that is fun for the entire family. 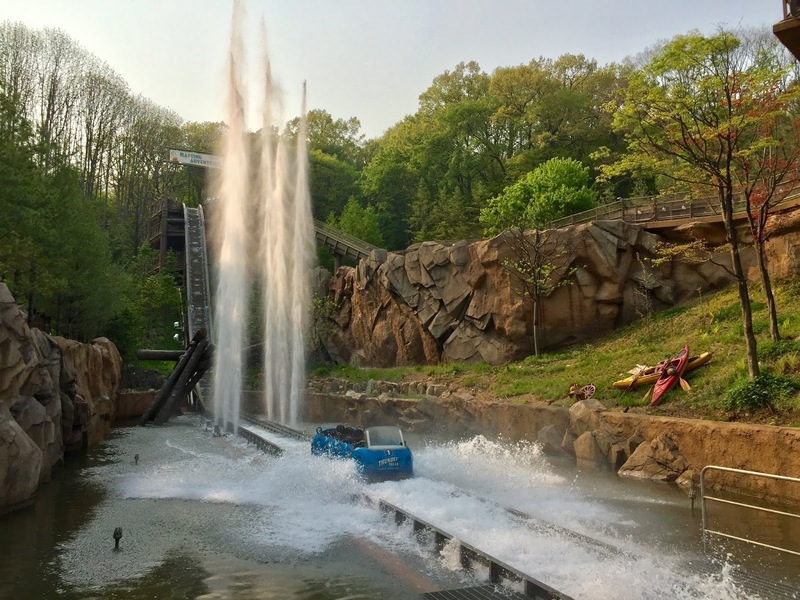 It's wet, it's unique, and serves its value as a standout water ride. 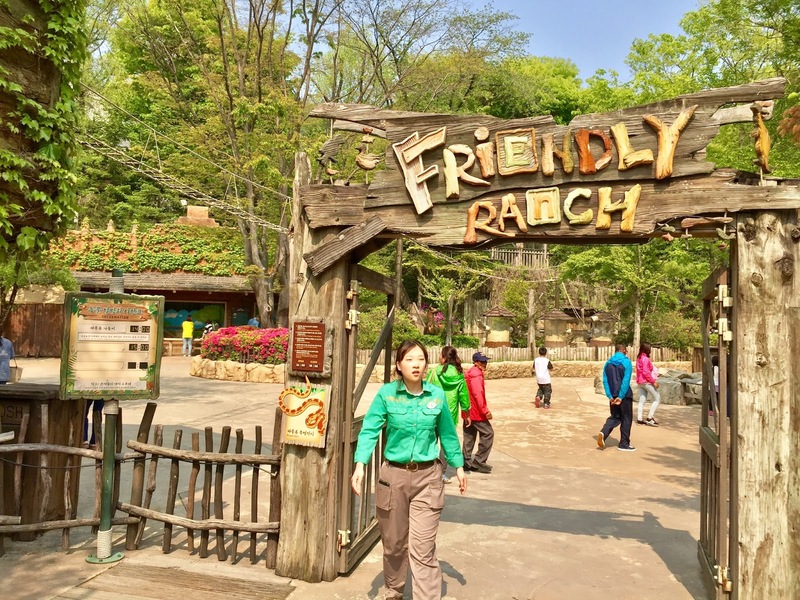 Highly recommended while visiting the park! 8/10. Located close to Thunder Falls is a themed area (I forgot what it's called) that eerily carries resemblance to Critter Country. Its focus on animal-based fairy tales and colourful structures makes it look and feel happier though. This somehow looks like Critter Country. Nicely themed entrance to Herky & Timmy's Racing Coaster. The main attraction at this part is a junior coaster called Herky & Timmy's Racing Coaster, which is a really cute name to begin with. 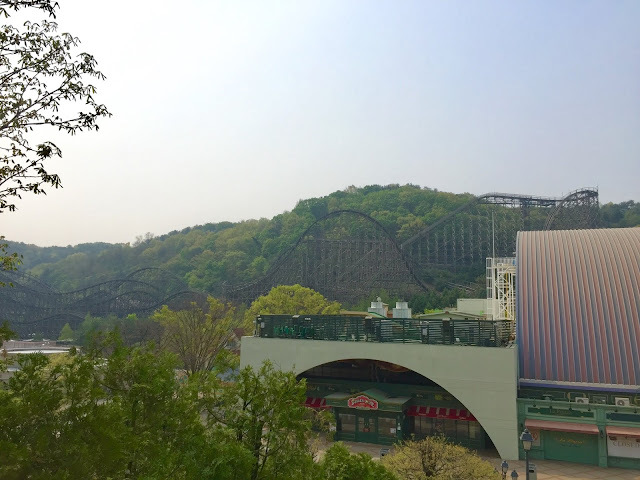 It's a relatively long roller coaster compared to other coasters of its type out there. The highlight of this roller coaster, however, is not the ride itself. Rather it's the location and the surrounding landscaping. 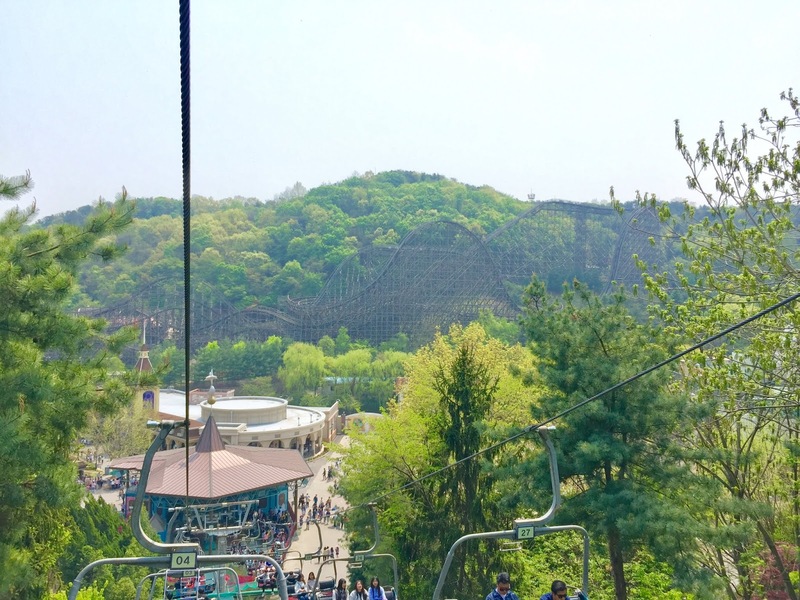 The view is magnificent, giving you one of the best views at the park overlooking the valley. The landscaping is superior. Flowers blooming and the coaster make it feels like you're a rabbit racing through a flower field! Look at the line going under the coaster itself! Riders blasting through the flowers. 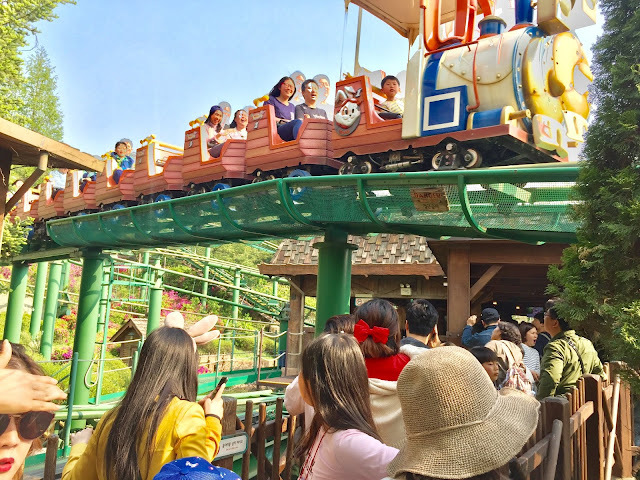 More theme parks out there should try to do a junior roller coaster that is similar to this: beautifully set, long, and fun. While it's not a chart-topper, you should do it if time allows simply because of the way the roller coaster is set by itself. 7/10. 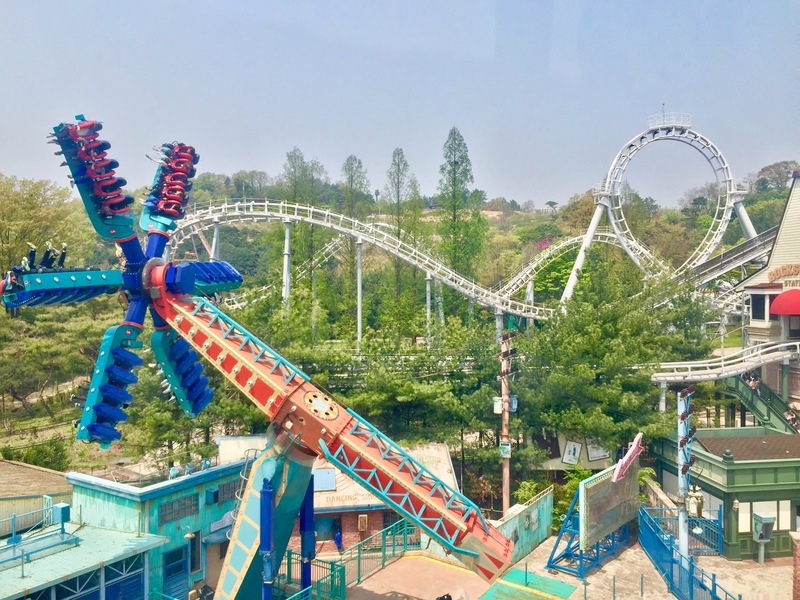 Rolling X-Train is a standard double-loop, double-corkscrew Vekoma model. 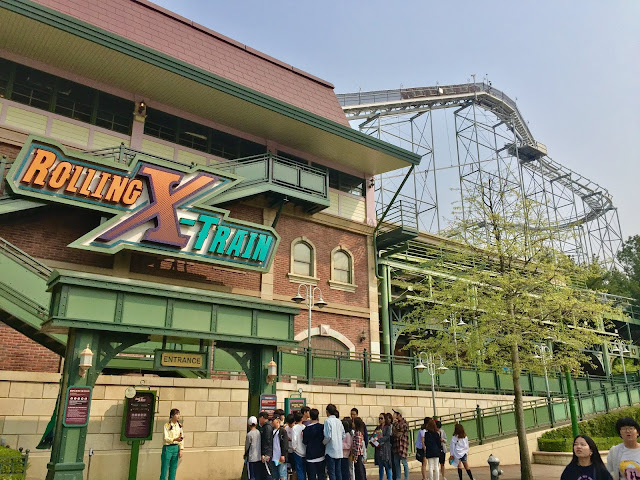 Lastly, there's Rolling X-Train, which is your standard Vekoma double-loop, double-corkscrew model. 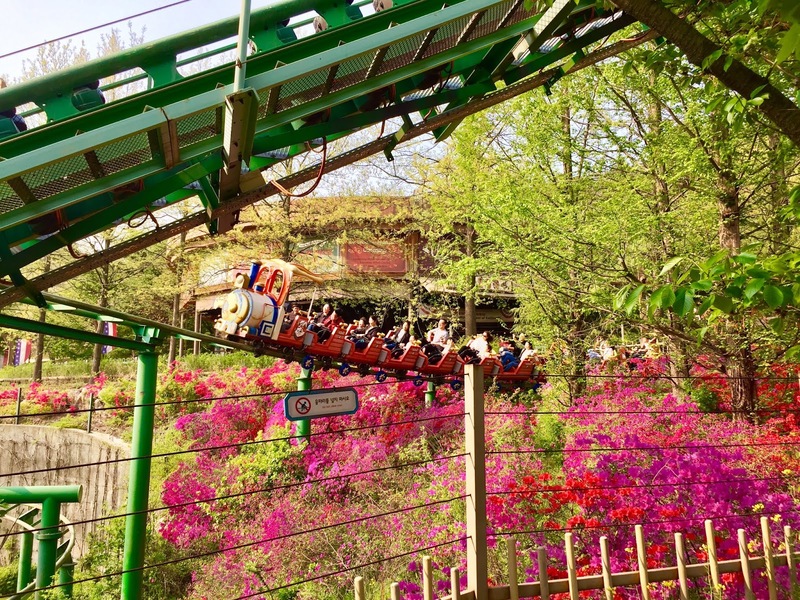 This one, however, uses Vekoma's latest open-air train, which supposedly create smoother experience. Unfortunately, this isn't the case with Rolling X-Train. Rough and choppy, this coaster will bang your head agains the restraints, which is something that you don't want to experience early in the day. You can skip this, but if you really want to ride it for the sake of credit, leave this up for later to avoid getting headache. 4/10. 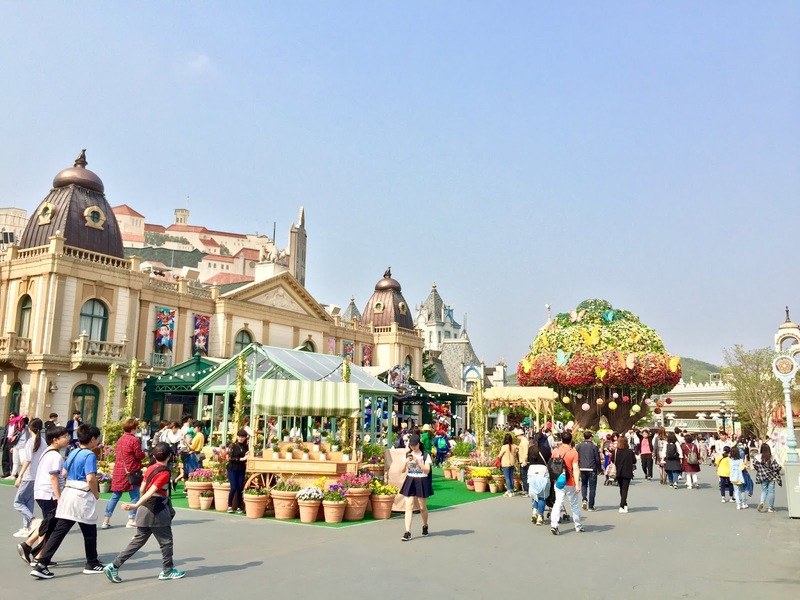 Aside from jumping from one attraction to another, I feel that Everland is a park that you shouldn't rush. There are so many beauties to be discovered everywhere and I think it's worth the one or two step(s). Slow down, deep breaths, and see. 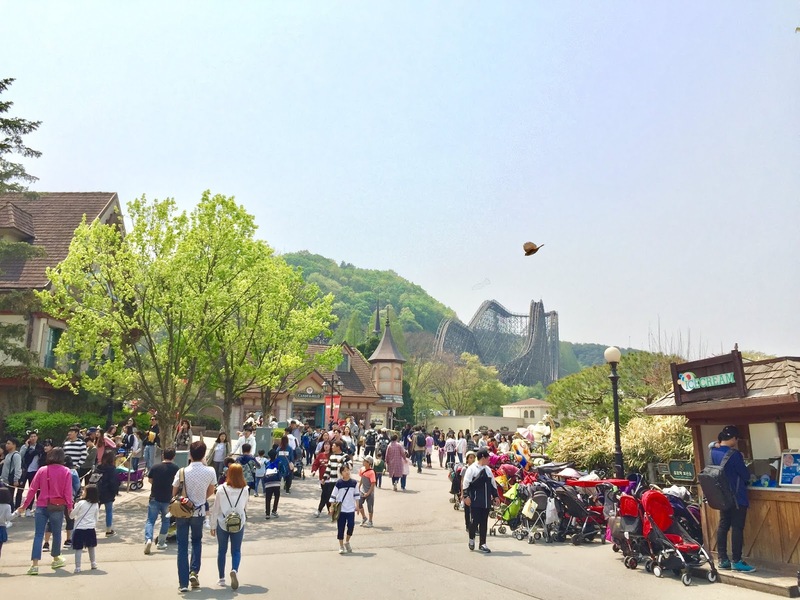 Sunny day at Everland is amazing! Take some photographs in whatever display they're showing. Closer to the entrance plaza, you'll get to enjoy the magnificent view of the surrounding nature. Everland being located in a mountainous area provides dramatic backdrop that will leave you in awe. I'm sure the view gets much better in autumn, when the trees change into brown in colour and the weather is just right. There are two ways that I feel give out really nice views of the park. The first is the cable car ride and the second is the cable lift ride. 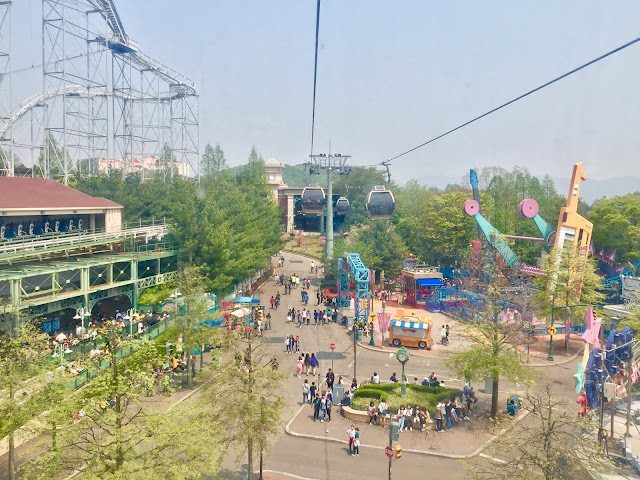 The cable car is faster and fully enclosed while the cable lift is much slower and your feet are dangling in the air. The cable car provides a dramatic way down to the valley... and magnificent view. The carnival section of the park from the cable car. 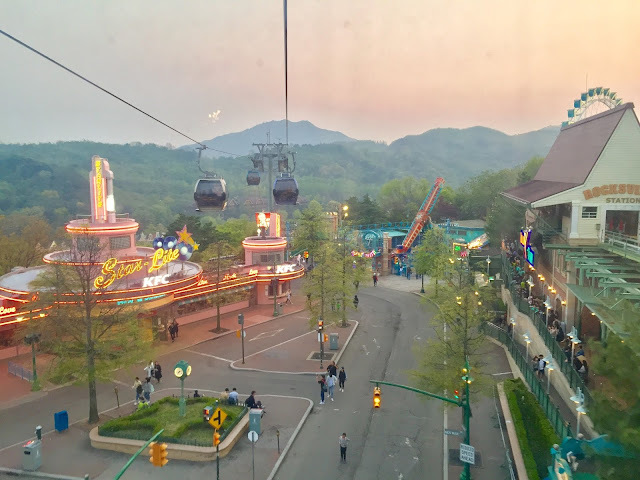 You can get an excellent view of T Express in action from the cable lift. Peek~a~boo: the ferris wheel unfortunately didn't run. In the valley, it's all about display rather than the view. People seem to be enjoying themselves a lot too down there. The lagoon by European Village, where guests are often seen relaxing. Is it still Christmas? What day is it again? Look at how pretty this is! Everland is a theme park that surprised me on a grand scale. I thought I was going to spend only a couple of hours there to simply ride T-Express, some rides, and that was it. I was wrong. This park has so much to offer that if you're not quick, one day might not be enough to cover it all. Combine that with challenging terrain and you're basically in for a whole day at the park from opening to closing. Nicely themed and solidly conceptualised, Everland is a regional theme park that capitalises itself successfully on the massive investment with T Express. With the demographics of the visitors becoming more diverse than ever (more teenagers and thrill-seekers than ever), I think it's a matter of time before Everland decides to install one or two more thrill machines. 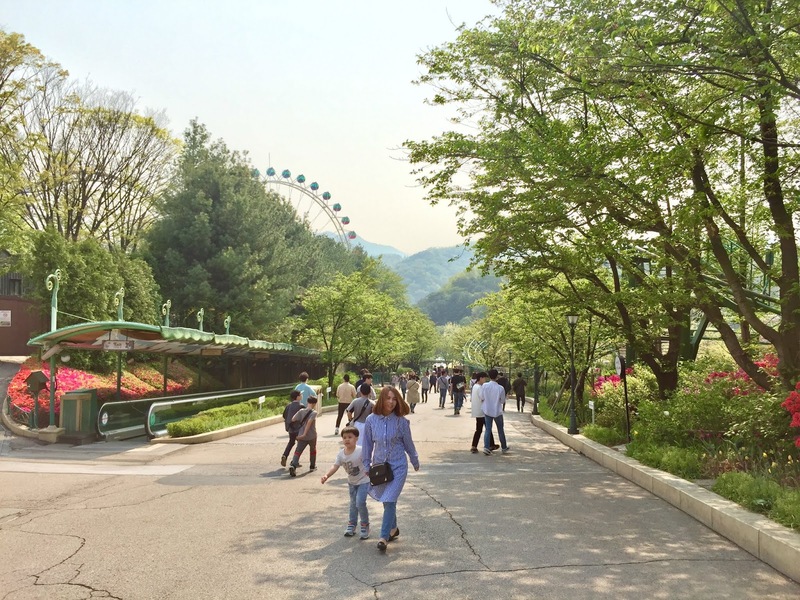 The park's lush landscaping gives it a more intimate feel, despite the many rides standing inbetween. The Midway section of the park is a great place to slow down and relax: lots of food options and places to sit down here. Staffs at the park are really enthusiastic in doing their jobs. At the Amazon Express attraction, for example, the staff rapped his way while giving safety instructions. The station at T Express is always full of scream and joy thanks to the bright mood reflected by the team working the attraction. Security did an excellent job in managing the crowd and ensuring smooth traffic flow. I found this park such a joy to look at, to experience, to be at. Can we have more of this around the world, please? I also feel that the park is one of the best examples when it comes to providing inclusion to family visitors. That stroller parking at the Lost Valley attraction is simply great and other theme parks should take notice. 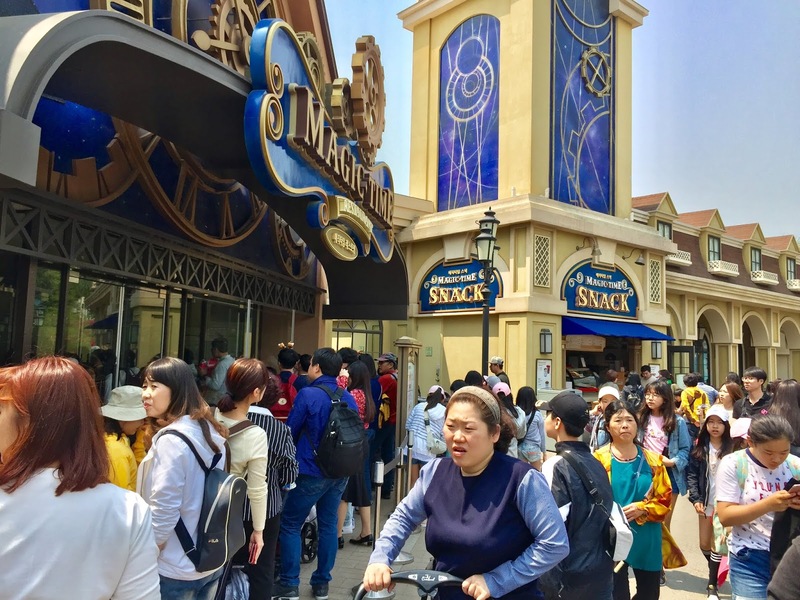 Disney should take note of this as this can actually improve the traffic flow at their parks, given that most of their stroller parking spots are blocking the ways of the main pathways. 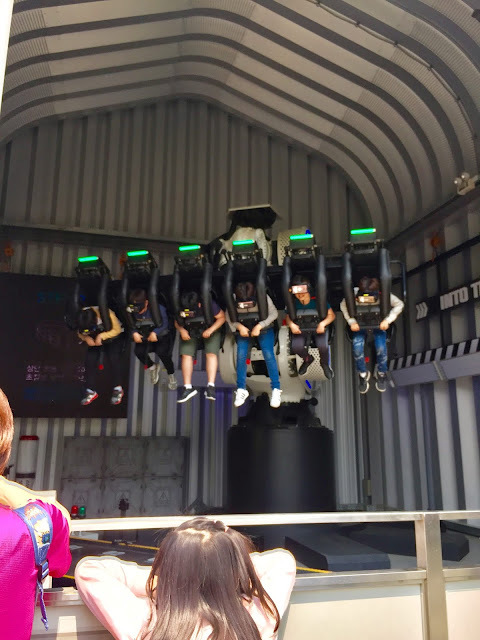 One of the VR-based attractions at Everland using KUKA. How about this Gyro VR attraction instead? 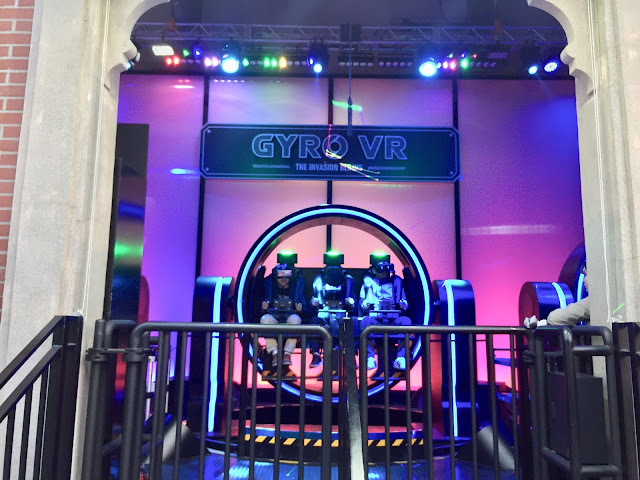 One aspect that I dislike and found questionable is the decision to install many VR-based attractions throughout the park. Worse, these attractions are actually upcharged attractions. The charge is KRW5,000/ride, which isn't that much actually. I just don't like the idea of upcharging something that could've been essentially enjoyed for free. 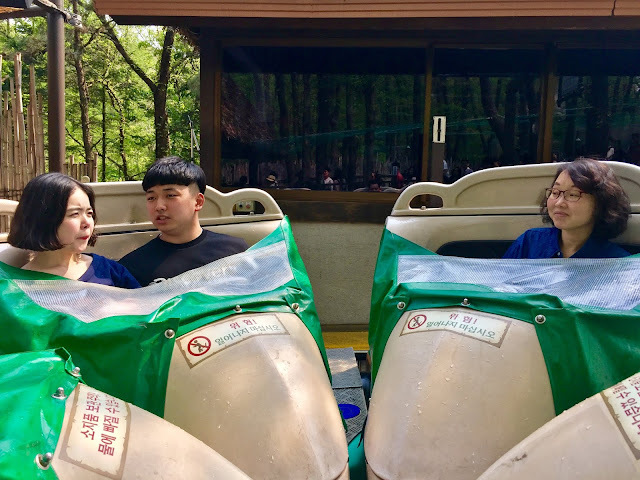 Given the park is owned by Samsung, it's to be expected that all VR devices use exclusively Samsung technology and wearables. 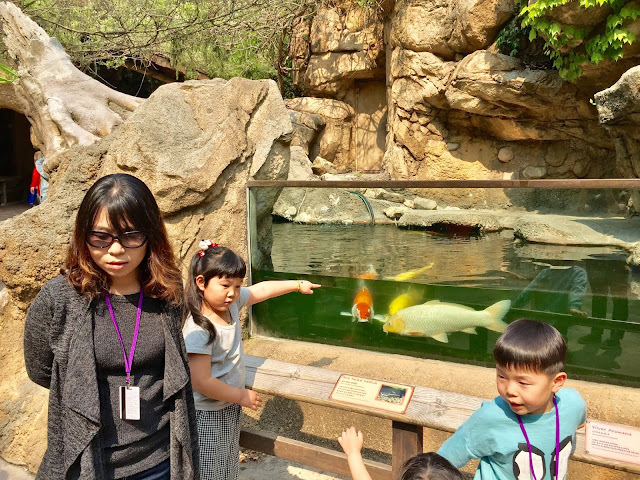 I think it's also worth to visit the animal exhibitions in the zoo section of the park. 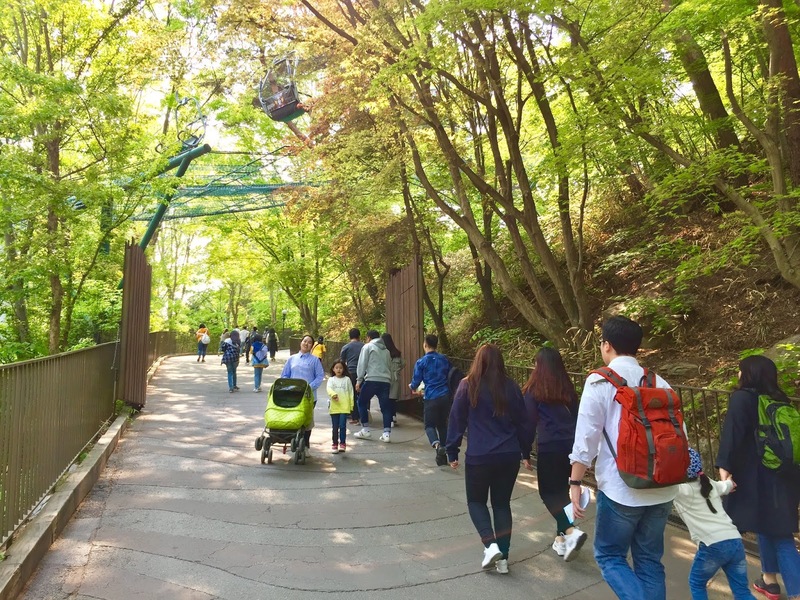 It's a section where you can take a much more relaxed stroll around the park as you walk below the shades of the trees. Can you guess what animals are inside these exhibitions? Wanna pet a goat? Sure. Go ahead! Do it here at the Friendly Ranch! Don't forget to capture the sunset view of the park! 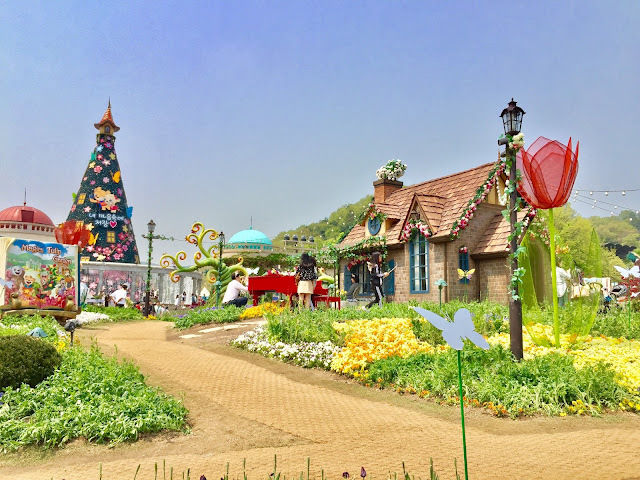 Everland might as well be a Neverland. In South Korea, it's - after all - the only never that has ever existed in physical forma. With its beautiful landscaping, great staff operations, and nice hybrid of zoo-theme park, it's no wonder this park is the largest in the nation. Everyone is having a good time here, and people do stay until it closes. That says a lot about how much people enjoy this park. 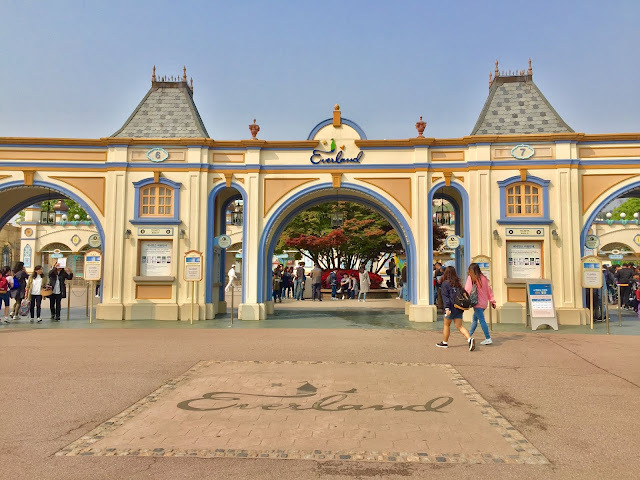 The only reason why Everland is not the most visited theme park in South Korea, to me personally, is because of its location. While there are plenty of public transportation options to conveniently reach this theme park from Seoul, the capital city of South Korea, it's still a 60-90-minute trip each way. Hence, Lotte World has more visitors due to its location being in the centre of Seoul itself. Everland guests stay within the park for a long time, which is surprising. 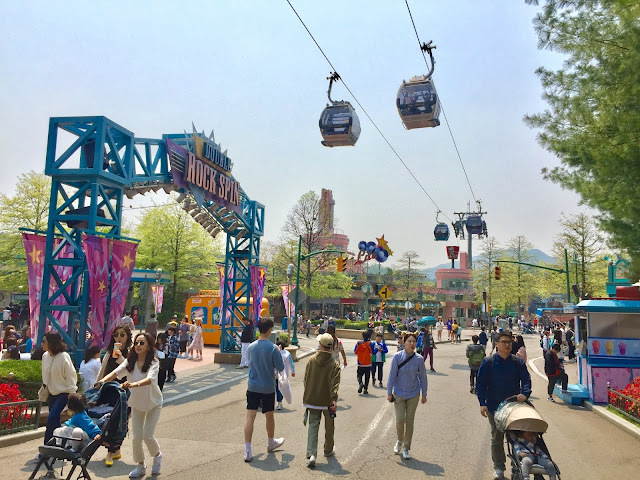 A recommendation for Everland would be to install one or two more thrill machines in the future in order to attract more young adults and adults visitors. T-Express in itself is already one of the world's best roller coasters. Perhaps they can invest on something that is truly unique and different. Perhaps a highly-themed dive coaster like Baron 1898 at Efteling? Or how about even the standard-model of a Blue Fire - Launch Coaster by Mack Rides? This would've gained massive attention in the country. 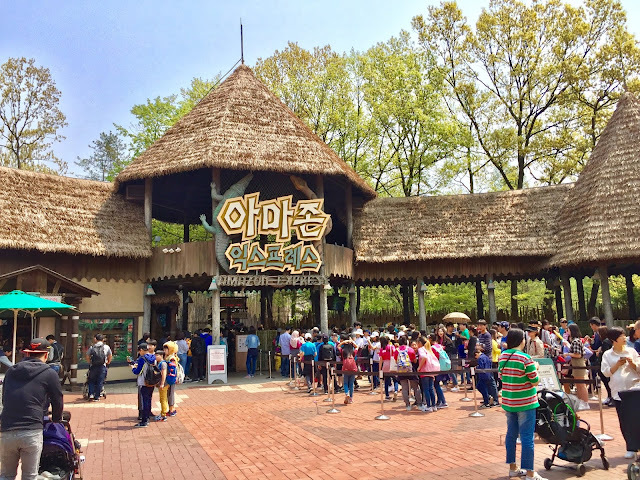 But for now, Everland will remain a classic in South Korea. As the park grows, it will be a matter of time before the park goes truly global with a great line-up of attractions.